Lord Mandelson: "The same handful of people who have always held this view will come back again"
Gordon Brown is secure as prime minister as Labour has reached a "settled view" he will lead them into the election, Lord Mandelson has said. He was speaking after a day of drama in which two ex-Cabinet ministers called for a secret ballot of Labour MPs to decide on Mr Brown's leadership. No ministers and only a handful of Labour MPs publicly supported the move. But the BBC has learnt plotters against Mr Brown felt six Cabinet ministers may back them in the "right circumstances". The BBC's political editor Nick Robinson said sources had named the potential Cabinet rebels as Harriet Harman, David Miliband, Bob Ainsworth, Jack Straw, Jim Murphy and Douglas Alexander. He stressed there was no suggestion or evidence that any of those named was involved in planning the coup attempt. He added that Geoff Hoon and Patricia Hewitt, the two former ministers who had written to Labour MPs calling for a secret leadership ballot, had insisted that they had no direct contact with any member of the Cabinet. The six issued statements backing Mr Brown on Wednesday although Nick Robinson said some of these took several hours to arrive and focused more on Labour's re-election efforts rather than on Mr Brown's own position. Our political editor said that rebels in the party had believed that each of the six named ministers agreed with their view that a change of party leader was necessary and would act accordingly. He said one of those behind the plot had told him: "We wanted to create a storm. Our purpose was to create the space for the Cabinet to act. They bottled it." However, our political editor said that one of the six named ministers had criticised the way the plot was organised, telling him: "It was amateurish. It could never have succeeded." Backbench Labour MP Eric Joyce told BBC Radio 4's Today programme there were "one or two aristocrats at the top of the Labour party who think if they act coy they may inherit the leadership of the party". "I think it's fairly widely known that there's a few people who imagined that if they just sit there quietly the backbenchers will do their work for them and then can perhaps inherit, for a brief period, the prime ministership," he said. "I simply think there's an element of internal ambition where people aren't prepared to take their own risk." In their letter to Labour MPs - news of which broke during prime minister's questions - ex-defence secretary Mr Hoon and former health secretary Ms Hewitt said Labour was "deeply divided" over the issue of the party's leadership. They said a secret ballot was the best way to resolve these differences and unite the party ahead of the general election campaign. Only a handful of Labour MPs, all long-standing critics of Mr Brown, came out publicly in support of the move and it appeared there was little momentum behind the idea among the majority of MPs. Mr Hoon seemed to acknowledge this, telling the BBC that "by and large", MPs "had not taken" the opportunity of confronting the issue of the leadership despite it being "almost impossible" to ignore. He added that he was worried that leadership questions would now surface during the election campaign. Many MPs attacked talk of a leadership vote as disloyal and leading Cabinet ministers - including Lord Mandelson, Home Secretary Alan Johnson, Chancellor Alistair Darling and Education Secretary Ed Balls - described it as a unwanted "distraction", as they urged the party to focus on economic recovery and the election fight ahead. Mr Johnson said Mr Brown was the "best man" to lead the party while Foreign Secretary David Miliband said he supported Labour's re-election effort led by the prime minister". Northern Ireland Secretary Shaun Woodward said on Thursday that Mr Hoon and Ms Hewitt had been "profoundly wrong". He also insisted he did "sit in a happy Cabinet". 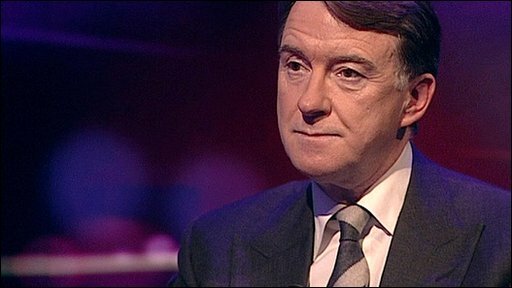 In a interview with the BBC's Newsnight programme, Business Secretary Lord Mandelson said the revolt had "blown through the corridors of Westminster and out of the window". Referring to Mr Hoon and Ms Hewitt, he said: "I am quite sure, as they saw the situation, they thought they were acting out of the best interests of the party but the party didn't agree with them." Lord Mandelson said he believed that Gordon Brown was the "best possible" leader for Labour. "The Labour Party want Gordon Brown to remain as their leader which is why [today's] events did not exactly catch on," he said. "The party has reached a settled view. They want Gordon Brown to lead the party as prime minister into the general election whenever it takes place and they don't want to open the question of the leadership." Lord Mandelson, a key ally of Gordon Brown's since he returned to the Cabinet in 2008, said there was "no queue" of ministers telling him in private that the prime minister should step down. He said the party should focus on getting its policies and strategy in place for the election, which is expected to be held in May. Opposition parties have reacted to the fresh bout of leadership unrest within Labour by calling for an immediate general election. The Conservatives have launched a poster campaign, featuring Mr Hoon and Ms Hewitt, aiming to highlight divisions within Labour. Gordon Brown has seen off two concerted attempts to force him out as leader over the past two years. Last summer, James Purnell resigned from the Cabinet and called for a challenge to Mr Brown but key Cabinet figures rejected his appeal.